We are delighted to offer for sale this beautifully restored 1of 551 Aston Martin DB2/4 MkIII, coachwork by Tickford, RHD 4 speed manual with overdrive. Delivered new to Cape Town in 1958 where 2 South African owners have for filled enjoyment until returning to UK in 1996, the previous owner acquired vehicle in 2001 and spent some years in Germany until 2017. In autumn of 2017 Redline Engineering UK started what would be 15-month restoration program with no stone left unturned. Extensive amount of work has been undertaken commencing with taking the car back to a bare metal shell, luckily the shell was mostly dry only needing small minor repairs or rectifying poor repairs, shut gaps all addressed leaving this shell dry with many more motoring years ahead. Full respray in Silver with body trims all re- chromed. Restoration worked continued with the front and rear brakes, suspension, a top end engine rebuild with particular attention to cylinder head being completely overhauled, chrome work, exhaust & fuel system. Parts for this project all supplied by Aston Dorset, partial re-trim with new rubbers carpets headlining - retaining all of it’s original features that have been meticulously cleaned or treated including original leather giving this wonderful car a classic original patina interior. All of this extensive work has been photographically documented of the restoration, on file, build sheet from Aston Martin, original tool kit, MOT December 2019. This car starts on the button with very little effort and fabulous to drives. 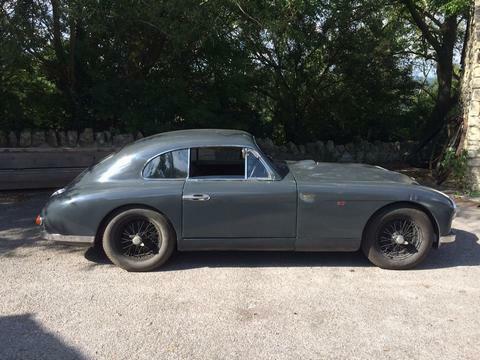 A very rare desirable Aston indeed.